As a renowned name in the automotive industry, CarUsed.jp delivers exemplary car export services to consumers around the globe. Geared towards meeting your needs and expectations, we guarantee fast and reliable transactions as you import Japanese used vans. Our services are rooted on honesty and integrity because we value your trust and loyalty. Our expert team is more than willing to assist you every step of the way as you import Japanese used vans manufactured by reputable car makers. 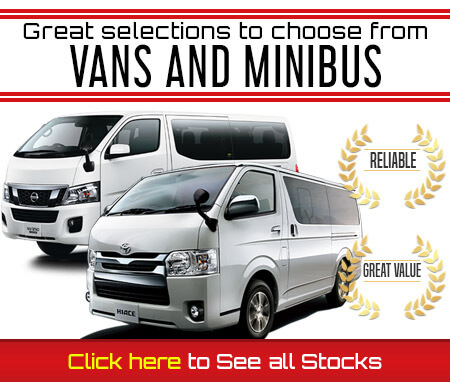 From the most affordable to the most robust van models and makes, you can always count on our team to give you access to the best valued second-hand vans of Japan. Exporting Japanese used vehicles for over 10 years, our company is a prominent institution in the industry. We are centered towards helping you import Japanese used vans with ease and comfort because we highly value your satisfaction. Over the years, we have managed to build relationships with respected people in the industry, enabling us to get access to exclusive van models and makes. We have a wide array of options that can perfectly fit your specific needs. 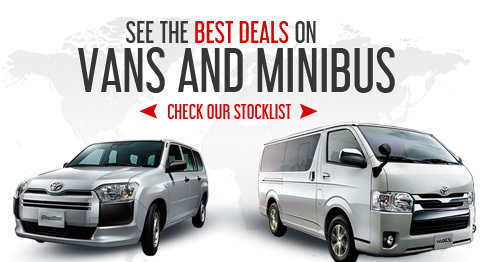 Whether you need a van for business or personal use, you can definitely rely on us to find the best valued van that fall right under your budget. Plus, our user-friendly site enables you to efficiently filter your options based on manufacturers, van types and budget. If you can’t find a specific vehicle, you can ask help from our team so you can expand your search and effortlessly import Japanese used vans. Needless to say, CarUsed.jp is your perfect partner if you plan to import Japanese used vans. With us, you can get access to limitless options without worrying about delays in services and transactions. Why Import Japanese Used Vans? Why import Japanese used vans when you can buy brand new models and makes? The Japanese are forerunners in providing top quality products and services. Home of reputable brands such as Nissan, Toyota and Mitsubishi, Japan is a progressive country that incessantly seeks change and innovation. Japanese car companies are known for manufacturing robust, fuel-efficient vans that offer lasting services. In terms of aesthetics, Japanese vans are designed to provide passenger comfort without sacrificing cargo space, making them the top choice of big families and business owners who need to carry large, bulky loads. Add to that, most Japanese used vans are less vulnerable to wear and tear because the Japanese are known for upgrading their vehicles every 3 years. Governed by a strict automotive testing regulation, Japanese van owners are mandated to acquire a testing certificate 3 years after their purchase. Only then are they permitted to use their car for another 2 years. While obtaining a testing certificate is not impossible, the country’s strong economy provides the Japanese the power to purchase and upgrade vans every 3-5 years. Instead of applying for a certificate, they sell their car in auctions and replace it with a new one. This led to the increasing number of people who import Japanese used vans. As more vans are auctioned on a weekly basis, more people resort to importing used vans instead of buying brand new models. Aside from being a budget-friendly option, buying used vans also offer you the sense of security you need, especially since you are investing in top quality vans made up of reliable and cost-efficient parts.